Cellini No. 388/126 Model Keyboard Accordion, c. 1960s, made in Italy, black with white pearloid front and trim finish, original hard shell case. 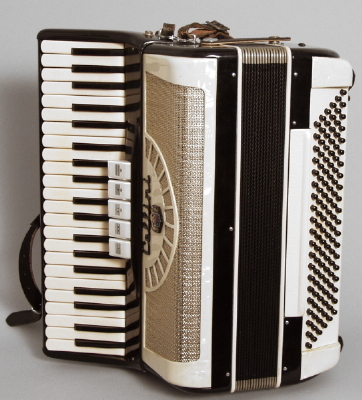 A very nice 120 bass "Ladies' Size" piano accordion, that sounds and plays as good as it looks. Great for players with smaller hands or for those looking for a more compact "travel" accordion with a full range. 41 treble keys. 5 treble registers, 1 bass switch. 3/4 reeds. 17" treble keyboard. Black plastic casing with white pearloid framing the treble grill and the bass keyboard. Ivoroid plastic "white" keys on the treble side and the bass key pallet is also ivoroid. Original leather straps and hard shell case. Height is 8 in. (20.3 cm. ), 17 in. (43.2 cm.) width, and 16 1/2 in. (41.9 cm.) . Excellent Condition.